Until the last few years, domestic less-than-truckload carriers determined freight rates using classification guidelines put in place during the early 20th century when railroads were the primary method for transporting goods. By many accounts, this class-based system was – and still is – confusing for shippers, complicated for carriers to manage, and costly to implement. As time has gone on, the challenges of this pricing model have caused both carriers and shippers to look for simpler alternatives – enter density based freight pricing. Today, carriers increasingly use density (size and weight) in tandem with the old class-based system to determine freight rates and ensure that they’re compensated for the actual space being used on their trailers (a shortcoming of the class-based pricing system). To aid in this shift, they’ve implemented automated pallet dimensioners throughout their terminals. These dimensioners are allowing carriers to quickly capture accurate measurements of their customers’ freight, which they’re using to optimize truckloads and develop pricing models that are more reflective of their actual transportation costs. Unfortunately for many shippers, this shift is contributing to rising shipping costs and more frequent freight audits. To mitigate these costs, shippers are starting to invest in automated dimensioning equipment of their own. However, many of them find it difficult to determine the actual value a pallet dimensioner can add to their operation. Through a series of questions, this article aims to help shippers identify that value and determine if pallet dimensioners are truly worth the investment. Question 1: Is density a key component in the classification of your freight? In density-based pricing systems, larger, lightweight items are classed higher and are more expensive to ship than smaller, heavier items. This is because large, lightweight items use more space on a trailer and typically can’t have other freight stacked on top of them. Thus, these items not only take up the space they physically occupy, but also the open, unusable space above. As a result, these low-density goods are often the first to be singled out by carriers for re-measures and re-weighs. This results in more frequent freight audits and billing adjustments for the companies shipping them. Examples of low density freight that might be classed at higher rates include, light fixtures, air filters, insulation, ductwork, backpacks and suitcases, winter coats, bicycle helmets, packaging materials like bubble wrap and packing peanuts, freeze-dried food stuffs, and thousands of other products shipped daily. If your business ships these items or other low-density goods, pallet dimensioners can provide the accurate, certified-for-trade measurements you need to avoid unexpected freight audits. Question 2 – How often do you ship internationally? Density based pricing has been the standard for parcel and LTL carriers in Europe, Mexico, Canada and other parts of the world for years, and as such, pallet dimensioners have become an important tool for these international operations. 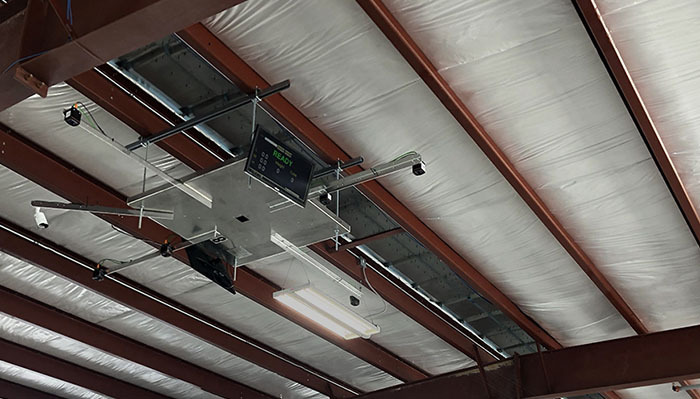 Today, you can walk onto an outbound loading dock at a distribution center or forwarding warehouse and your chances of seeing a pallet dimensioner suspended from the ceiling are significantly higher than they were even just a couple years ago. If your enterprise regularly deals in international freight, it may be appropriate to start looking at your options in automated dimensioning. Question 3 – Are re-classes and audits still catching you by surprise? Freight audits are never fun to deal with. One minute it’s business as usual, the next you’re writing a check for an additional $223 to your carrier. Unfortunately for shippers, these kinds of surprises are only expected to become more common as carriers continue to improve their dimensioning capabilities. According to some estimates, pallet dimensioners are already allowing carriers to dimension between 30% and 50% of the freight that comes through their terminals. As more pallet dimensioners are installed and the percentage of dimensioned freight rises, so too will the number of re-classes shippers see – unless they start dimensioning themselves. Whether a pallet dimensioner is worth the investment for your business depends largely on how much re-classes are costing you today. If you’re seeing losses of even just a few thousand dollars each month due to freight audits, an affordable pallet dimensioner like this one can completely pay for itself in less than a year. If re-classes are costing your operation more than that, a full return on your investment can be had even quicker. Question 4 – Is saving time a priority? Automated warehouse solutions are making logistics operations more efficient every day. From automated picking and sorting equipment, to automated conveyor systems and warehouse management software, companies have never had more time-saving solutions at their fingertips, and pallet dimensioners are yet another tool at their disposal. How much time can a pallet dimensioner save you? Consider how long it currently takes you to measure pallets by hand, anywhere from 40 to 60 seconds is typical, and that doesn’t include the time it takes to enter those measurements into your WMS or TMS, take photos of the freight, and calculate its density and cube. Pallet dimensioners do all of that in 5 seconds or less per pallet, while also allowing your employees to focus on more important tasks. You can see how the savings quickly add up. So, are pallet dimensioners worth the investment? Ultimately the answer is different for every business. However, by asking yourself the questions listed above, you can begin to assign dollars to the time you’ll save, the freight audits you’ll avoid, and the increased efficiency of your operation. For more detailed insight into the ROI you can expect from a pallet dimensioner, contact us today. We’re happy to answer any questions you have about automated dimensioning and help you determine if it’s something your business can benefit from.